There are mens suits and then there are Italian design mens suits by Tazio. In a world of suits, it always feels good to know that there is a brand that has the style that makes you look your best and mens suits by Tazio are just that. 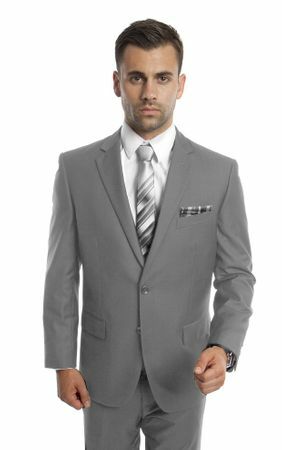 This medium gray color suit comes as a 2 piece style that will never go out of style. The jacket has a regular fit with double side vents and flat front style pants. Made of fine super 150s wool feel poly/rayon.